I saw this film as part of the Criterion Collection’s Eclipse Series 17: Nikkatsu Noir Box. In the late fifties and early sixties, Japanese youths were more interested in American and French cinema than watching Japanese films. 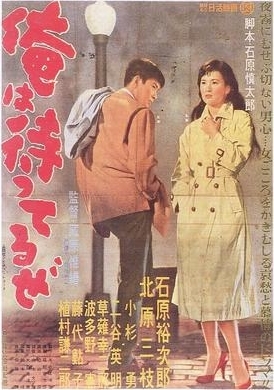 To bring in younger audiences, the Nikkatsu film company produced several noir films in the style of the Western ones. I Am Waiting is at the forefront of this western-imitation noir. Influenced by Elia Kazan’s On the Waterfront, the story follows Jôji (Yujiro ishihara) who is an ex-boxer who threw away his career when he was in his prime. His path intertwines with Saeko (Mie Kitahara), a once famous singer who lost her voice and became forced to work for a gangster at a cabaret. Together they fall in love, kept apart only by their own distant dreams. While created in the image of Western noir films, I am Waiting is unique. The plot, while typical of western noir, has a distinctly Japanese twist to it. Japanese conceptions of shame and honor accentuate the drama and tension surrounding the protagonists and their decisions. Story aside, the crooner music sung throughout the film shows provides a taste for the post-world war II era music heavily influenced by Western Europe. The protagonists are wonderfully played. It is refreshing to have a protagonist played by a man who isn’t handsome. The casting of the non-dashing Yujiro Ishihara was a brilliant choice. His acting, and his romance with Mie Kitahara’s character is entirely believable, something few films can pull off. Mie Katahara is simply beautiful, in a word, but in the everyday-sort-of-way, and her voice perfect for the role of a cabaret singer. The biggest strengths of these actors is that they are real. They are not the handsome plastics Hollywood has employed for decades. They are what they are. The Cinematography is decent, but every once in a while it has moments of beauty. The use of light is done artistically, and is especially impressive in the opening scenes. Overall however, this is artistically nothing spectacular. In conclusion, I Am Waiting is a fun, well-made film reccomended for any fan of the noir genre who wants to try something a little different. This is also a good film for anybody interested in late fifties/early sixties Japanese cinema. Thanks for posting on this film, Id like to get see this boxset soon.